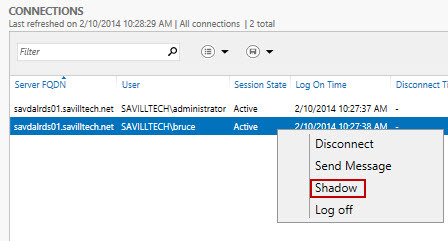 Terminal Services had the ability to shadow a user’s session; however, this was removed in Windows Server 2012. Now Windows Server 2012 R2 brings this capability back. It can be initiated using Server Manager as shown below, but many people also want to initiate from the command line. This shows the session ID that I can then use (e.g., mstsc /shadow:2) for the user bruce session.